Summary: Quibbles aside, this film should be an enjoyably cosy way to pass two hours of a winter’s evening, especially for the romantically inclined. An all star cast, a renowned director (Michael Radford of Il Postino fame), a Shakespearean script and one of the most romantic locations in the world – could The Merchant of Venice possibly fail to be a box office success? 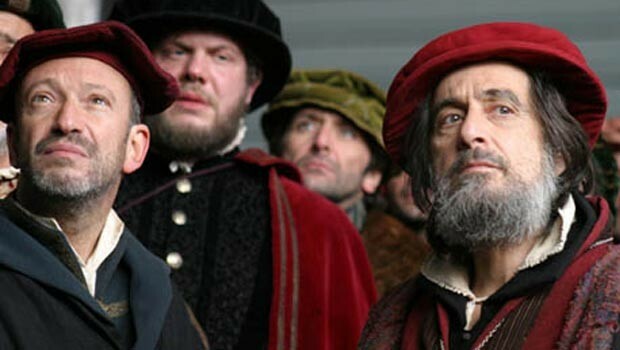 Al Pacino gave a scene stealing portrayal of the put upon and enraged Shylock, superb save for a slight US lilt breaking through in key emotionally charged speeches – which may annoy some. Unfortunately the producers chose to refer to his character throughout using Shakespeare’s epithet of ‘The Jew’. Whilst its usage is true to the play, in Shakespeare’s original it is not used exclusively. Despite the arguably balancing “Does not a Jew bleed…” monologue this will surely earn the film a perhaps justified anti-Semitic label. Jeremy Irons gave a flawless performance as Antonio, the subtle changes of his facial expression alone adeptly conveyed a turbulent sea of emotions. Joseph Fiennes again excelled as the lead male in a Shakespeare-based love story and Lynn Collins gave a measured rendition of fair Portia. Moreover Venice came off looking a bit shabby – which may be the case nowadays but is worlds away from how it would’ve appeared in the era in which this film was set, when it was a prosperous and vibrantly colourful trading town. However the cinematography itself was of the highest quality providing many picturesque moments, and costumes and set were of breathtakingly high quality. Quibbles aside, this film should be an enjoyably cosy way to pass two hours of a winter’s evening, especially for the romantically inclined. Although perhaps not so great if you’re a follower of Judaism. Powerful epic or anti-Semitic Hollywood drama? : you decide.